Looking for a new group photo sharing iPhone app? Did you go to a great party recently and there are now five facebook photo albums sharing photos? Do you and other parents find yourselves scrambling to put together photos for an end of the season scrapbook for your kids’ soccer teams? Are you in charge of your school fundraiser and need to put together a slideshow? Pinweel’s iPhone app may be your answer. You can create group photo albums with a public reach via Pinweel’s social networking community or a private group from your contacts, Facebook friends, and Twitter followers. The graphics have a fresh, light, and bright energy that make you excited to share photos. Helpful hints and clear graphics lead you through the Pinweel iPhone app. You add an album title, then you can add users. The clear graphics at the top of the page let you access your contacts, Facebook friends, Twitter followers, and Pinweel friends. You add people who are then notified. All of your replies and responses are accessed from your Pinweel iPhone app inbox. If you make your Pinweel group album private, only those invited can view and post photos to it. To create a group photo album, you can add photos from your iPhone libraries or shoot photos from the camera within the Pinweel app. Once your photo is selected, you can apply effects like Instagram, Snapseed, and Hipstamatic. You then have the opportunity to add a caption and share via Facebook and Twitter. The interface of adding photos is just like Instagram. But, the fun, distinctive Pinweel touch is the way a photo group is displayed. Each photo has a smaller Pinweel profile photo in the lower left hand corner. When you check out a group photo album, you’ll know who added the photo. And, the developers at Pinweel Inc. deserve some serious props for the default profile picture. It is a colonial era black and white portrait. It’s a refreshing, nuanced vibe that shows the care and thought. For public group photo albums, you can dive in and check out popular Pinweel group photo albums. Once selected, up to four pictures fill your screen. Intuitively, I tried to scroll down to find the other pictures, but they didn’t appear. To access more photos, you swipe to the right. The next batch of photos appear. This is not the typical way of scrolling and incorporating more images, but it is not a terribly difficult functionality to perform. For each photo, you can comment, like, dislike, mark as inappropriate, or share. You can access these functions with taps on the screen and via the navigation bar at the bottom of the screen. You can share via Facebook and Twitter, email, and text. The Pinweel iPhone app brings together the people with whom you are making memories and helps you preserve the photos of special events–big and small. 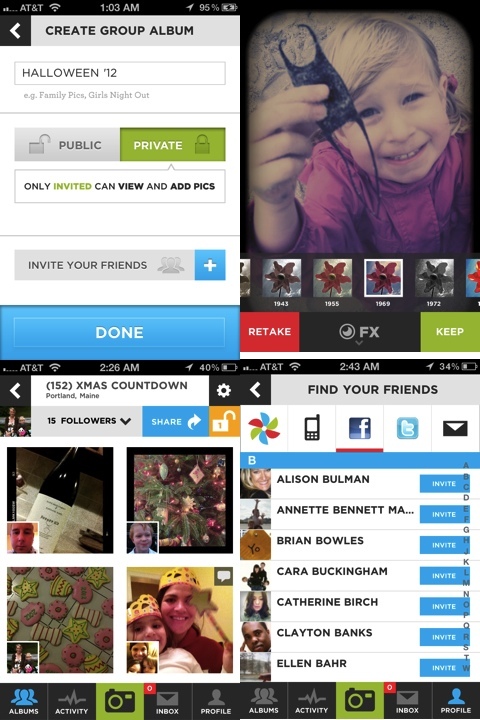 AppSafari review of Pinweel was written by Jenni Ward on February 24th, 2012 and categorized under App Store, Free, Photos, Social, Video. Page viewed 5997 times, 2 so far today. Need help on using these apps? Please read the Help Page. LOVE this app. Incredibly easy to use, and uber convenient for photo sharing. Kudos to the masterminds behind Pinweel…I give it double thumbs up! A great APP and so easy to use!